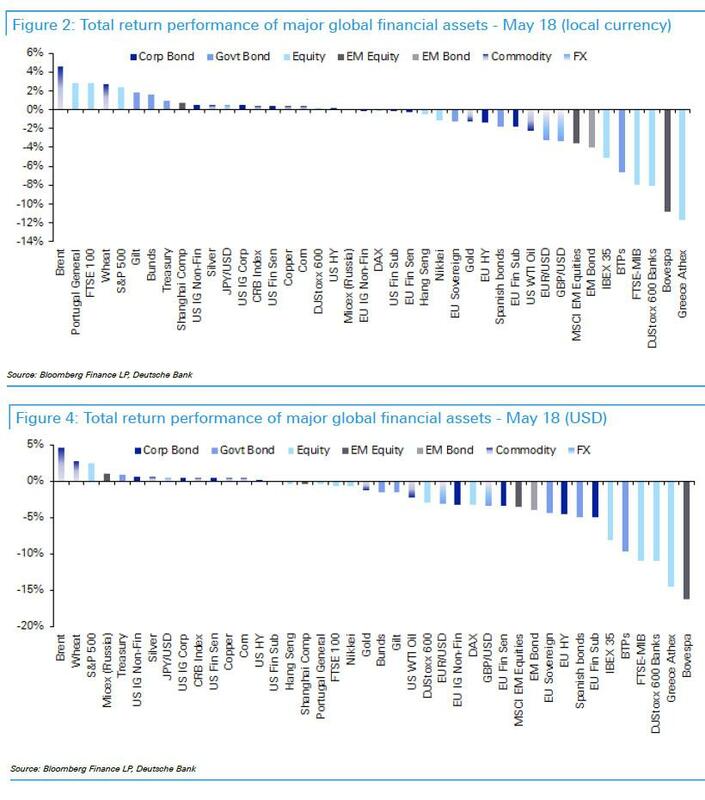 Earlier we showed that despite some significant cross-asset volatility, not to mention substantial declines especially across emerging markets and Italian stocks and bonds, in the month of May quite a few markets and asset-classes shrugged off the EM and Italian woes, and posted modest if steady returns, including the FTSE 100 (+2.8%), Stoxx 600 (+0.2%) and, of course, the S&P 500 which rose +2.2% in the month. Yet what is far more remarkable is just how concentrated the S&P gains were in May, and how just one company was responsible for a quarter of the S&P500's gains. 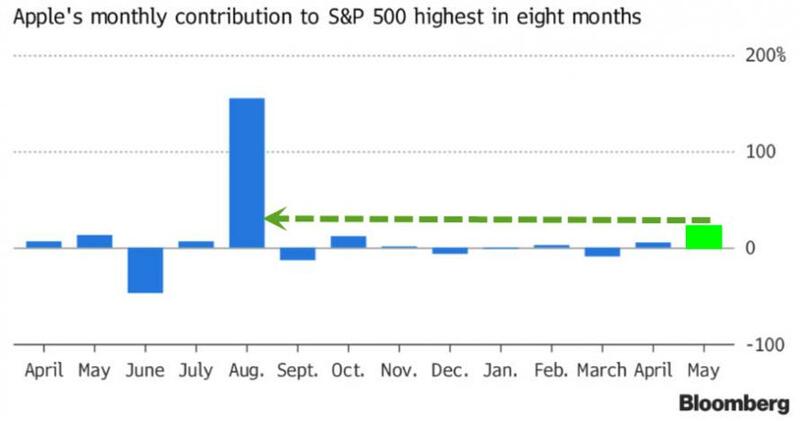 As Bloomberg's Andrew Cinko calculates, it was all about Apple, which accounted for 23% of the S&P 500's gains last month, its biggest contribution since August of last year. 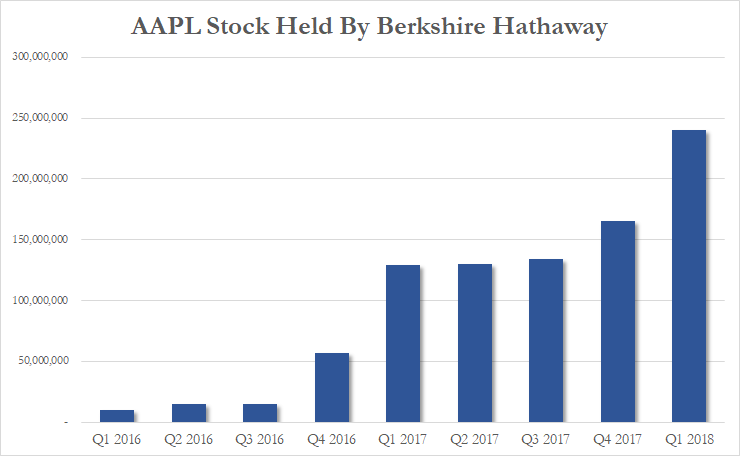 As a reminder Apple hit a new all time high thanks to its latest, massive buyback plan and also thanks to the latest Buffett purchase of AAPL stock by Buffett who added another 75MM AAPL shares, bringing this total stake to 240 million shares, worth over $45 billion. Whatever the reason behind Apple's surge, without it the S&P's gain would have been 1.65% instead of 2.16%, meaning that just AAPL alone was responsible for 0.50% of the S&P's May gain. This was AAPL's biggest monthly contribution since last August, when AAPL alone accounted for over 150% of the S&P's return. However, as Cinko notes, "in the intervening months, Apple's effect on the broad market was small mostly because it's move was paltry while other stocks bounded higher or lower. For example, in January Apple sank 1.1% while the index rallied 5.6% as Amazon surged 24%." However, in May, the tables were turned with Apple soaring 13.1% while the S&P 500's second and third biggest stocks, Microsoft and Amazon, rose 5.7% and 4.1% respectively. Meanwhile, AAPL's contribution to the Dow was even greater, accounting for 35% of so-called "Industrial Average" last month, followed closely by Boeing with 34%.